Building a home addition is akin to building a new custom home, with the added complexity of having to tie it into the existing home. Not only does the home addition need to provide the additional living space, but it also has to meld in well with the home’s exterior. Building your own home addition also adds another level of complexity if you are actually planning to do the construction yourself. As a matter of fact, if you don’t have previous home building experience I highly recommend not going the route of actually building your own home addition. Instead, I suggest hiring a general contractor who will do the day to day planning and managing of the construction project. Find local general home addition contractors here for obtaining free quotes. 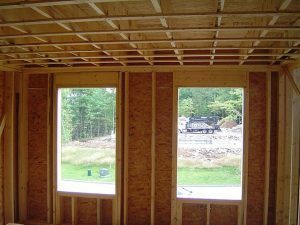 Regardless of whether or not you are building your own home addition or hiring a general contractor to lead the project, the number one most important task in building a home addition is doing the upfront necessary homework and planning. As part of the home addition planning process you will need to address the following topics. Specify the purpose of the room addition space. Determine who will be the general contractor. Use one of these home construction guides and save time and money, as well as hassles, on your home building project. By thoroughly working through these eight points during the planning phase of the construction project you’ll be able to obtain accurate home addition cost estimates, both from the various sub-contractors you’ll need to hire, in the event you are building your home addition, and from the material suppliers. If you elect to go the general contractor route, then you’ll need to provide the home addition plans to several general contractors to quote. Upon receiving the quotes you’ll need to carefully analyze them. The contractor quotes should be very thorough. They should include detailed material lists and a schedule for completing the project. The quote should also include a payment schedule, and an initial deposit request. Make sure not to pay too high of an initial deposit to lock in the contractor. A 10-20% deposit should be sufficient. Also, the payment schedule should be for work completed to your satisfaction. The general contractor should have included in his or her quote all of the various sub-contractor tasks. He/She will manage the sub-contractors and ensure that all the work gets completed per the home addition plans. Thus, you should only have to deal with one contractor in the home addition construction process. So again, follow the eight steps above in my “build your own home addition guide” and you should end up getting the home addition that you envisioned. 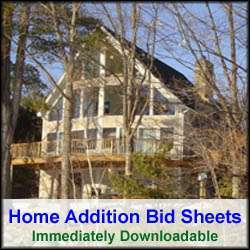 For more help on how to build your own home addition, see HomeAdditionPlus.com’s Room Addition Bid Sheet. 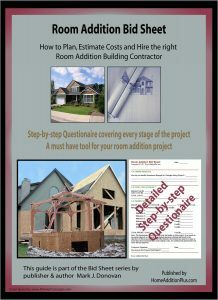 The Room Addition Bid Sheet provides you with the knowledge and information on how to plan a room addition project, and what to look for when hiring contractors. It also includes a detailed cost breakdown table and a spreadsheet for estimating your own new solarium or glass sunroom addition building costs.